Sorry about some of the picture quality but it was such a zoo at the mall because of the holiday Monday. big lineups at the dressing room so I grabbed what I could and tried on a few items that I thought had the most potential. I much prefer the mall on weekdays and also prefer to go to Coquitlam which is a bit more of a peaceful mall farther into the suburbs. No sign of the new Gratitude Wraps yet but that is on my hit list along with the Static Plum CRB (pictured bellow) and the braided luon reflective headband. Also I’m keeping my eyes peeled for a new run pullover that we haven’t seen yet. I know were going to be seeing Run Inspire Pullovers in the new colors but I want to see something different. Some of the new items I saw today. Not photographed are Plum and Wish Scubas. Very popular at the store today though. Centered Pose Tank. Looks a lot like the Tadasana Tank. I don’t like extra straps and all of those seam details on it. Perhaps another color will change my mind but at first glance I don’t like it. *hmm, check out the scubas in the picture. Looks like a new pink scuba on the left (or is that a remix?) and a wish scuba folded on the table. Braided Luon headbands. Got one in Black today. New Scuba hoodie in Black and not positive what pants these are. Perhaps the power dance pants in static and wish. Run: Dash Pants. 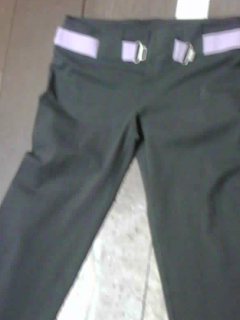 At first I didn’t like them as they are quite long, have ruching at the calf, deep pockets like on the Polocross Pants at the hips/thighs and the static panels on the side. I grabbed them just to photograph and didn’t try them on. I later saw a pair on the mannequin with Lilac detailing and there was another Wish Blue one and I thought they weren’t too bad on and actually quite nice for someone who is tall and lean. I’ll have to see pictures of these on more body types before I consider them for myself. I do like that they have reflective detailing on them and are a mid rise. 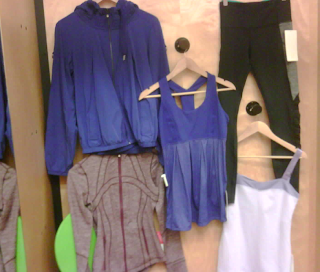 I saw some Run: Inspire Crops in Coal with Lilac detailing and those were very, very cute. None in my size were unpacked yet. Static Plum CRB. Of course I bought that one. It’s gorgeous. I was hoping to see it in just plain flat luon Static Plum as well, just like the Power Y pictured bellow. I was very happy to find this today though. I do like the shiny static luon with added polyester but the power y pictured bellow in the matte luon is just a little bit subtler. So gorgeous I’d buy it in both finishes. Heart Tank. Also available in Teal Zeal/Space Dye Teal Zeal, Plum and Static Plum detailing and in retrospect I should have tried the Plum one on as Lilac is not thinning or forgiving on me. 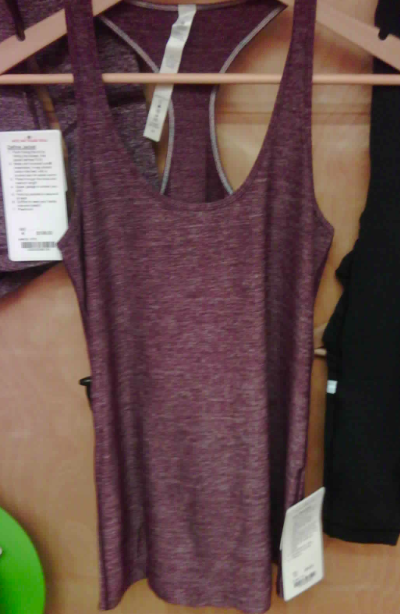 Cute tank, I liked the straps a lot but I wasn’t in love with this tank in this color on me so I didn’t take it. 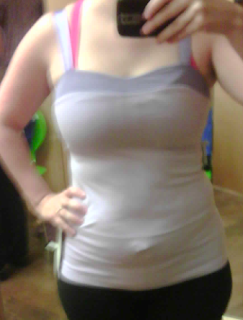 I think I may try a size up in this and forgo the bra support. I did really love the straps on it which where like a satiny thick bra strap. Power Dance Tank. I loved this tank. Yes, it is ‘maternity’ like, but I loved the sheer luon material in Wish. it was available in black/coal (or perhaps it was all black), Lilac space dye/lilac and Wish blue. They were all really very pretty but I love Wish Blue. It’s very similar to the Bliss tank from the summer but with thicker straps in the luxtreme bodice and a sheer luon body instead of Tencil. I think you can safely size down in this for reduced flowyness. 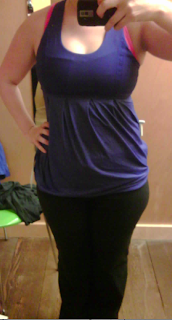 This is a size 8 on me and the luxtreme bra portion did not feel tight at all. It’s really the most comfortable tank I’ve ever tried on from lulu. 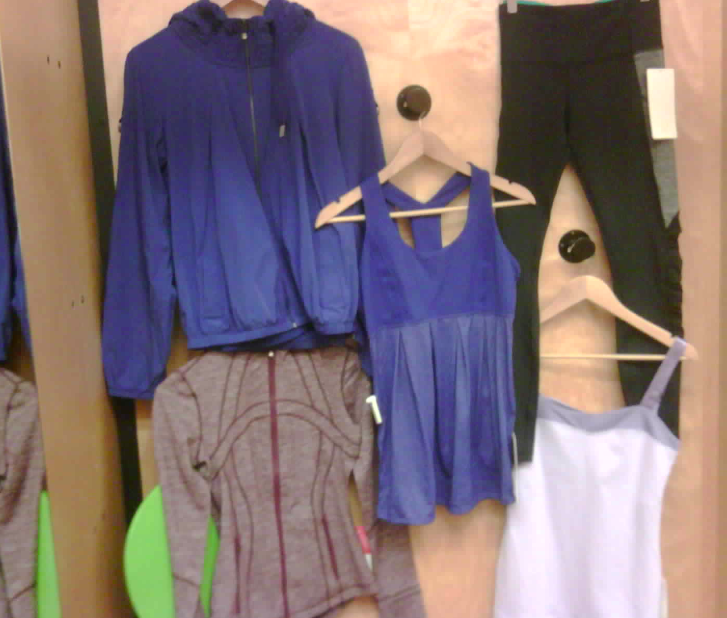 Power Dance Tank and Power Dance Crops. 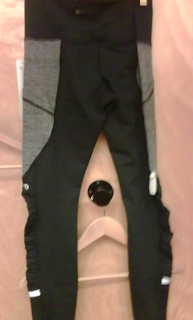 The crops were cute but I didn’t need the temptation for more legging like crops. Dog Whisperer Jacket in Wish Blue. Over all I liked it but there are a few things I would suggest need style improvements. I sized down in this and it was plenty big. 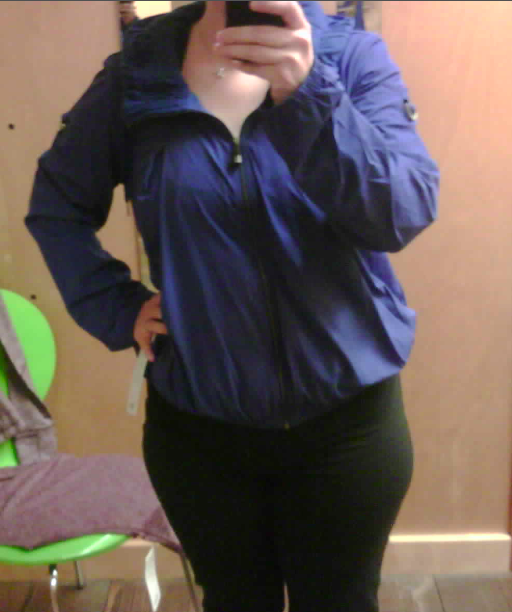 I liked that jacket sitting up higher on me and worn as a short jacket instead of pulling it down over my hips and poofing out in the back. 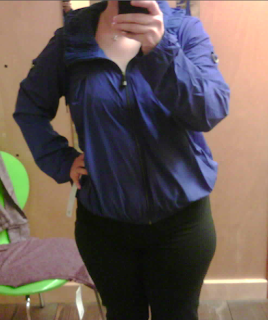 The fleece was really nice on the inside and the jacket was super comfortable. The one thing that bothered me other than the poofy back was the sleeves. The outer sleeve is quite a bit roomier than the inner sleeve so it felt funny when I had that top sleeve pulled down the way I liked it. The sleeves were quite long so it really bagged out at the wrist over top of that inner sleece. The metal loops at the top are to tie up the outer sleeve if you like it that way but I’m not sure about the functionality of having just the inner sleeve all the way down and the outer sleeve all the way up. It doesn’t look great that way as you can tell from picture on the bottom right. Dog Whisperer Pants. Hated these at first glance and didn’t try them on but they look good on this model. 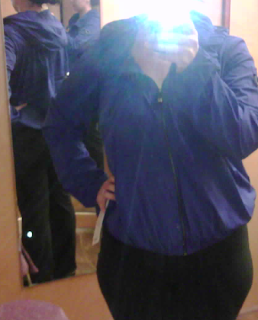 The pockets on them are awful for someone curvy like me. It may be cute on some but not me. 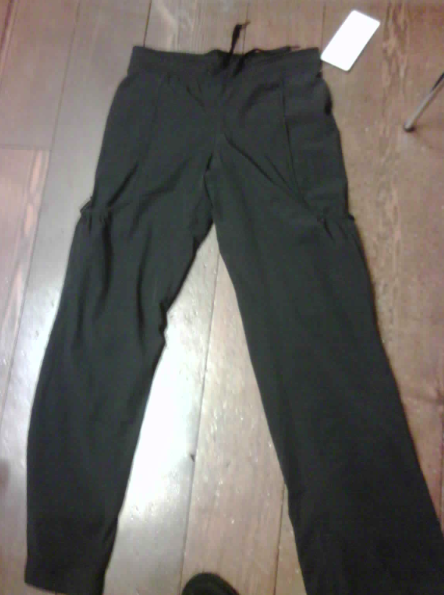 The outer shell is made of Glyde and the inner pant is a micro fleece so perfect for wet and cold weather. The huge pocket is meant for a tennis ball. "Heart Tank in Plum & Centered Pose Tank in Black"